A cupcake a day... - The Turtle Mat Blog - For news, features and competitions! The Turtle Mat Blog – For news, features and competitions! Rebecca Wilson on the subject of Bon Appetit!. Posted on May 16th, 2012. …May not keep the doctor away but definitely keeps a smile on our faces here at “Turtle Towers”. With Jubilee street parties fast approaching, we’ve been baking up a storm trying to find the perfect sweet treat with which to celebrate. The first of these delights is a cupcake recipe! As always, we would love to hear from you whether it be with recipes, pics of kitchen successes (or disasters), stories of how your Turtle Mats help catch culinary spills (they definitely helped when road-testing this recipe) or any other foodie thoughts. So without further ado, here’s the scrumptious cupcake recipe. A rich, moist and unashamedly decadent American classic! The red colour of these cakes originally came from unrefined cocoa powder but today is often made with red food colouring. However, here at Turtle Mat we like to keep things as natural as possible so have improvised with raspberry juice – the cakes now take on a slight pink hue instead! Create the raspberry juice by placing the raspberries, icing sugar and water in a pan over a low hear and leave (stirring occasionally) until enough juice is produced for 6tbsp or so; the juice should be roughly the consistency of single cream. Leave the reduced raspberries to cool and then strain the juice. Add the eggs, one at a time to the butter and sugar mix, beating well after each addition. Mix into a paste the cocoa powder, cooled and strained raspberry juice and vanilla extract. Add to the batter and again beat well. Mix together the white wine vinegar and bicarbonate soda (watch it fizz!) and then gently add to the cupcake mix (ensuring again it is fully incorporated). Divide the mix into the cupcake cases and bake each tin of cakes for 20 mins (or until a skewer inserted into the centre of the cake comes out clean). Whilst the cupcakes are baking make the cream cheese frosting by whizzing all the ingredients together in a food processor until thoroughly combined. This will appear quite liquid so place in the fridge for about an hour to firm up a little before use. Cool the cupcakes in their tins for about 10 mins and then transfer to a wire rack to cool completely before adding the frosting. 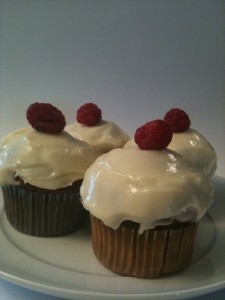 Top each cupcake with a raspberry and then enjoy! This entry was posted on Wednesday, May 16th, 2012 at 4:37 pm; on the subject of Bon Appetit!.